Wherever you are this morning, I hope you’re having a lovely weekend! I’ve compiled a bit of a meander for your weekend reading – a little bit of needlework news, stirred up with some inspiration and instruction, some embroidery history, a good cause, and other bits and bobs! So, you know the drill. Grab your favorite cup of something comforting, and lets go for a little stroll together! Tea this morning for me – and when it’s gone, so am I! Do you like to help out good causes in the textile related world? The Massachusetts Historical Society will be opening an exhibit called Fashioning the New England Family, where they’ll be sharing with the public some amazing historical garb. But the cost of publishing an exhibition catalog is prohibitive, when combined with the whole cost of the exhibition. In order to produce an exhibition catalog, they’ve decided to crowd fund the catalog on Kickstarter. You can find the crowd-funding page here. They’re not far from their goal. But it’s an all-or-nothing. If they don’t reach it, no exhibition catalog! And that would be a shame for posterity. The Massachusetts Historical Society is a non-profit, so donations beyond the rewards value (if you choose a reward level of giving) are tax deductible where applicable. Let’s get them to their goal! They’re oh-so-close! Besides, it’ll be a beautiful exhibition catalog – if you’re a textile, costume, stitching, history, clothing-in-general enthusiast, I think it’ll be a book you’ll love to have! An exhibition catalog is a large hard cover book that chronicles the holdings displayed in a museum exhibition. It generally includes descriptions of the holdings, magnificent photography, detailed information about provenance, historical implications, and whatnot, as well as essays and research about the various holdings and their place in history. Exhibition catalogs are usually only around as long as the exhibition is around, so they are limited in print run and often rare after an exhibition has run its course. Yet they often contain some of the best research about the items and the eras spanned by the exhibition. Some examples of excellent exhibition catalogs from the past include ‘Twixt Art and Nature and Fashioning Fashion, both of which I’ve written about here on Needle ‘n Thread. If you’re a lover of history and needlework, you might check out the series of blog posts that Ann Bernard has drummed up recently over on her blog at Stitching Idyllic. She’s been writing a bit about embroidered tapestries depicting historical events or otherwise related to historical events. If you enjoy reading about embroidered tapestries, I’ve got an ongoing infatuation with them, too! You might enjoy browsing through some past articles on embroidered tapestries, especially those that fall under the heading of “heritage tapestries.” There are lots of ’em around the globe, and they’re neat to read about! Remember the floral monogram book by Elisabetta Sforza that I reviewed earlier this month? Well, you’ll be happy to know that Needle in a Haystack has placed a couple more orders for the books, so if you ordered one, they’ll be winging their way to you soon! For those in the US who are still thinking about indulging in Elisabetta’s lovely book, you can also find it available here through A Stitching Shop. Would you like a wee bit of inspiration? Right over here on Instagram, you’ll find an embroidered version of the blooming heart pattern that I shared with you a couple weeks ago. It’s lovely! I posted the pattern on a Friday – I think she posted her finished photo the following Sunday. Not only is her work lovely, but golly, she’s quick! Speaking of social networking – and blooming hearts – for those of you who hang out on Facebook, I’ve started a new group called (oh-so-originally) Needle ‘n Thread Community! Once you’re in, you’ll find tons of inspirational stitching stuff going on. It’s a great place to be able to share photos of your work – I would love to see what you’re working on! – and to ask questions and get feedback, encouragement, suggestions and so forth from other stitchers. So come join us! Golly, Lorraine at Colour Complements has been busy! Have you seen her new Spring Collection? She recently added some really pretty springy colors to her thread collection at Colour Complements. They’re pretty luscious. I’m having a hard time resisting…….! What do you listen to while you stitch? I’m sure many stitchers out there have been tuning into the Olympics these days! I’m more of a listener. I like podcasts and audiobooks. When it comes to books, I’m a fan of many kinds of literature, but I especially love classics, non-fiction (biographies, histories, travels, survival stories and the like), and classic cozy mysteries (Agatha Christie, Dorothy Sayers, Ngaio Marsh and the like). A contemporary author who creates nicely researched historically-placed “cozy” mysteries these days is Charles Finch, and his new release A Woman in the Water comes out on Audible later this month. If you like those kinds of cozy mysteries, you might check out his Charles Lenox series – they’re pretty good, and they’re all available as audiobooks. An interesting audiobook I recently finished in the non-fiction category is Island of the Lost: Shipwrecked at the Edge of the World by Joan Druett. It was both gripping and thought-provoking. It’s about two different groups of people in similar dire situations, with two totally different outcomes. Try These Free Needlework Books Online! The Art of Drawn Work – a book on drawn thread embroidery. Mrs. Leach’s Fancy Work Basket – and yes, that is the title! 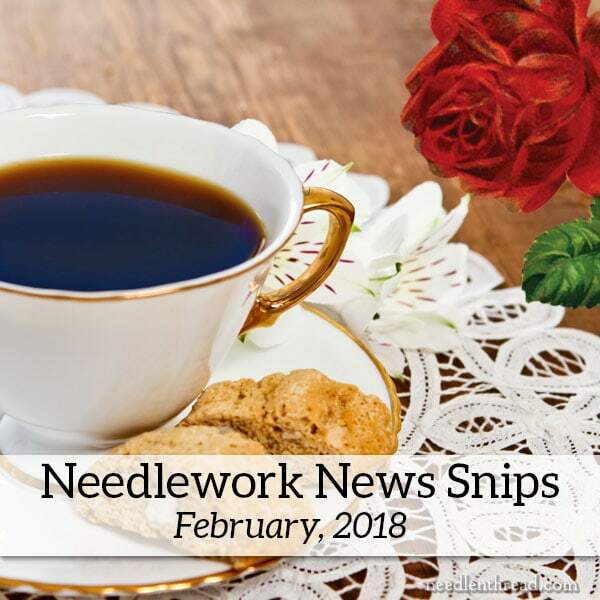 It’s a fun one to browse through, covering all kinds of needlework tidbits. The Needleworker’s Guide without a Teacher – a general book on needlework, fun to browse through and some great tips! I’m out. My tea is gone. The day beckons! Enjoy your weekend! What a super visit to Ann Bernard’s blog. I love historical embroidery, so for me this was a nice treat. There is so much to read but I don’t mind, when my hands hurt from to much stitching I relax and enjoy reading about embroidery. The Monogram Book, thank you for asking A Needle In A Haystack to get more copies. I’ve joined your FB page and there are some beautifully embroidered piece there. I’ve just glanced at Stitching Idyllic it looks really interesting, when I have more time I will certainly have a more detailed look. Thanks for sharing all your News Snips I hope you had a great stitching weekend. Just found this. Goody. And thanks for the audio book ideas. I too like voice background. I can quit every episode of Friends as I find other newer shows annoying. I liked the link to the drawn work book. any recommendations for fabrics to use? thanks. With drawn thread, I’d go for a 32 count or so even weave linen. Another needlework podcast you might like is Stitchery Stories, http://www.stitcherystories.com, hosted by Susan Weeks.